Restricted Item (Hazardous materials). This item is currently only available for store pickup or ground-freight shipping. Please contact us for a ground freight quote, or change to the 1-gallon size of this item which is not restricted. 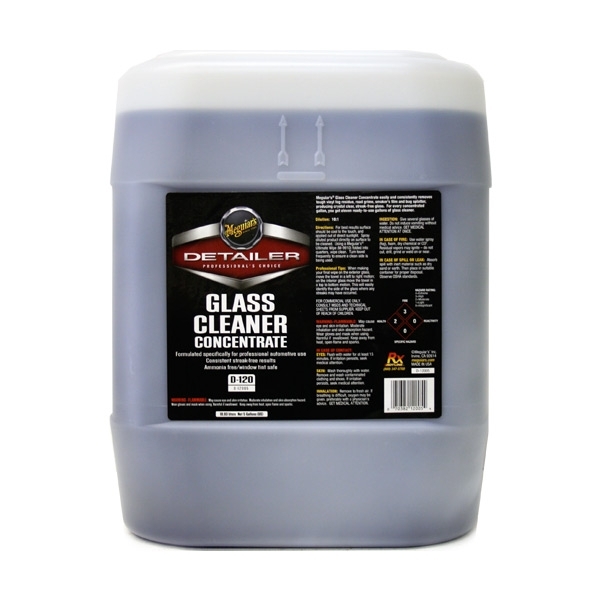 Meguiar's Glass Cleaner Concentrate easily and consistently removes tough vinyl fog residue, road grime, smoker's film and bug splatter, producing crystal clear, streak-free glass. For every concentrated gallon, you get eleven ready-to-use gallons of glass cleaner. For best results surface should be cool to the touch and applied out of direct sunlight. Spray diluted product directly on surface to be cleaned. Using a Meguiar's Ultimate Wipe (M9910) folded into quarters, wipe clean. Turn towel frequently to ensure a clean side is being used. When making your final wipe on the exterior glass, move the towel in a left to right motion; on the interior glass move the towel in a top to bottom motion. This will easily identify the side of the glass where any streaks mayhave occurred. Restrictions Restricted Item (Hazardous materials). This item is currently only available for store pickup or ground-freight shipping. Please contact us for a ground freight quote, or change to the 1-gallon size of this item which is not restricted.